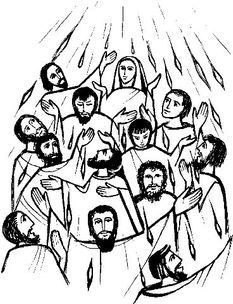 Note: There can be some confusion over the Pentecost 'Vigil Mass' (Lectionary Volume I p 596). If you normally have a Saturday night Mass (First Mass of Sunday) then for the Saturday night before Pentecost you should use the Readings for 'Mass during the Day' (Lectionary Volume I p 601‑602). The 'Vigil Mass' is an optional Mass of Satur­day Night (not of the Sunday). It's theme is `waiting in prayer' ' and it can be celebrated using all four Old Testament readings, in the same way as the Easter Vigil (in which case there should be a Psalm and a Collect after each reading, taken from the weekdays before Pentecost.) If you have no Saturday night Mass, you may consider having the Pentecost Vigil as a preparation for this feast, which ranks second only to Easter. If you do have a regular Saturday night Mass, lit would be difficult to celebrate the Pentecost Vigil. We arrive at the fiftieth day ‑ the completion of the Easter Season, and the completion of the Paschal Mystery: the Lord has died, is risen, has ascended to heaven and now gives birth to his Church, by sending the Spirit upon the apostles. This feast of the gift of the Spirit is so significant for us, because it marks the handing on of Jesus' ministry to the Church ‑ in the Church we are guaranteed the presence of the Lord, in his sacra­ments, in his ministers, in the Blessed Sacrament and in his Celebrated Word. It also marks the fulfilment of our thoughts about baptism throughout this season: the gift of the Spirit which we receive in Confirmation is the `seal' of our baptism, guaranteeing and confirm­ing all that baptism achieves. First Reading: Acts of the Apostles 11‑11. The meaning of this reading is obvious: it is the story of this day. There is a great sense of mystery in the first paragraph, seen in the words 'what sounded like' and 1 something that seemed like` ‑ almost as if Luke cannot quite find the words to describe the experience. You must ensure that amazement and astonishment is present in your voice throughout the second paragraph. Don't worry about the list of strange names ‑ but make sure you practice them out loud beforehand: it would be a shame if the reading were spoiled because your tongue 'tripped up' over “Phrygia and Pamphylia”! This reading tells us all what the Spirit actually does. The key word to emphasise (in a sense) is the "you" in the first line. As we have said before, the reading of Scripture is a here and now experience. We aren’t just celebrating something that happened on Pentecost Sunday two thousand years ago, but cele­brating a reality today. Remember this as you read. Be careful with the lists, both of vices and of virtues: don’t gallop through them, but read thought­fully and by that encourage your listeners to listen thoughtfully! Without acting or over‑dramatising, there can be a difference in tone between the negative things and the wonderful, positive gifts of the Spirit. "The Spirit of truth will lead you to the complete truth." 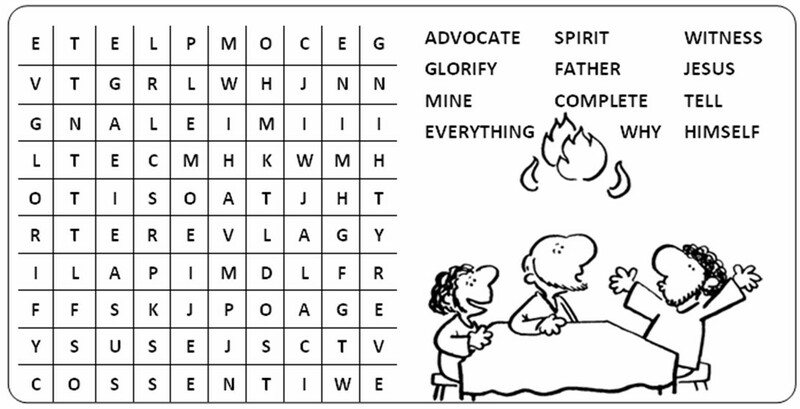 Click on the link below to get the wordsearch. Feel free to copy and paste it into your parish publications.